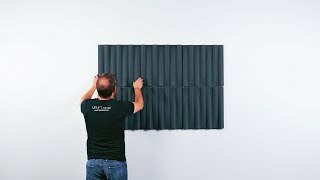 Absorb noise in your work area before it distracts you or your coworkers with the 3D Wave Acoustic Wall Panel by UPLIFT Desk. Designed to create a more sound-sheltered office space, you'll love the extra decibels these panels absorb. Dense Polyester fiberboard takes over the job of "office shush-er" while simultaneously adding stimulating texture and color to blank walls. Give yourself some peace and quiet with 3D Wave Acoustic Wall Panels. What are 3D Wave Acoustic Wall Panels? Why do I need these? UPLIFT Desk designed 3D Wave Acoustic Wall Panels for the purpose of reducing ambient noise in your environment while adding a touch of decor to blank walls. If you find it's hard to concentrate in your office, these panels can help you create a quieter workspace quickly and easily. How many can I use at a time? You can use these panels solo or in multiples, as many as your wall can fit! The more you use, the more sound that is absorbed. Panels are 23.75" square so with a little basic math you can figure out how many panels you need if you want to cover your walls for the utmost in sound absorption. There are a few options. The easiest way to install the panels is to simply hang them from nails on the wall. That allows them to be moved and changed easily. We do offer clips that can be used with optional adhesive strips as well for a more permanent connection. Take a look at the assembly instructions to see all available installation options. How much sound is absorbed by the panels? 3D Wave Acoustic Wall Panels have a Noise Reduction Coefficient of .8. This means that 80% of sound that reaches the panels is absorbed. In Acoustics, zero absorption is 0 and perfect absorption is 1, so these panels greatly reduce ambient noise, like chitchat and office background noise, letting you work with more focus and fewer distractions. Take a dive into the ocean with the 3D Wave Acoustic Wall Panel by UPLIFT Desk. Choose between Lagoon Blue or Dark Gray for this square, sculptured panel that easily attaches to any wall. The three-dimensional wave pattern will help you escape to faraway places in an office that is quieter, thanks to the sound-damping fiberboard panel. Fill your wall with multiple panels, or take things up a notch by mixing and matching colors for a checkerboard pattern. Backed by revolutionary 3M adhesive, you'll be able to adhere panels to your wall and remove them without damage or residue left behind on the wall with 3M Command Strips. The adhesive sticks to a variety of materials, including tile, wood, metal, and painted walls. Each 9 strip pack outfits two panels, leaving you with a tape strip for backup. Receive your accessories even sooner! Just add our expedited production option to your order. Place your order by 3 pm Central on a business day and we guarantee to start production and ship your order the same day. If placed after 3 pm, your order is guaranteed to ship the following business day. Note: Expedited production is different from expedited shipping. If you're interested in adding expedited shipping to your order, please contact us directly. This product comes standard with a 5-year limited warranty. We offer a 30-day trial on all single-item UPLIFT Desk brand orders, with the exception of solid wood and custom laminate desktops. If for any reason you're not satisfied, return the item with no outbound shipping or restocking fees. Return windows close 30 days after you receive your item. You are responsible for obtaining a Return Merchandise Authorization (RMA) within this time. All items must be disassembled and returned in "Like new" condition in their original factory packaging. Items not returned in this condition may be subject to additional fees. You are responsible for return shipping costs. To start a return, or to view the full returns policy, click here. $39.00 List Price: $49.00* The list price is the same as the MSRP (Manufacturer's Suggested Retail Price). It may not necessarily be the price at which the product is sold. We get it, you're looking for more than just a single desk. In most cases, we can offer bulk quantity discounts for orders of smaller purchases placed over time. Bulk deals are based on expected volume and the products you chose. We can also provide you with brochures and swatches to help you make your decision. Reach out to us to request a quote via phone (800-531-3746), email, (info@humansolution.com), or live chat from 8am - 7pm Monday - Friday and from 10am - 6pm Saturday. We guarantee everything we sell and have easy returns. We love our customers and are here to help. New product announcements, free product promotions, and discount offers. Our most recent newsletter will be sent to you immediately so you'll be in the know today!